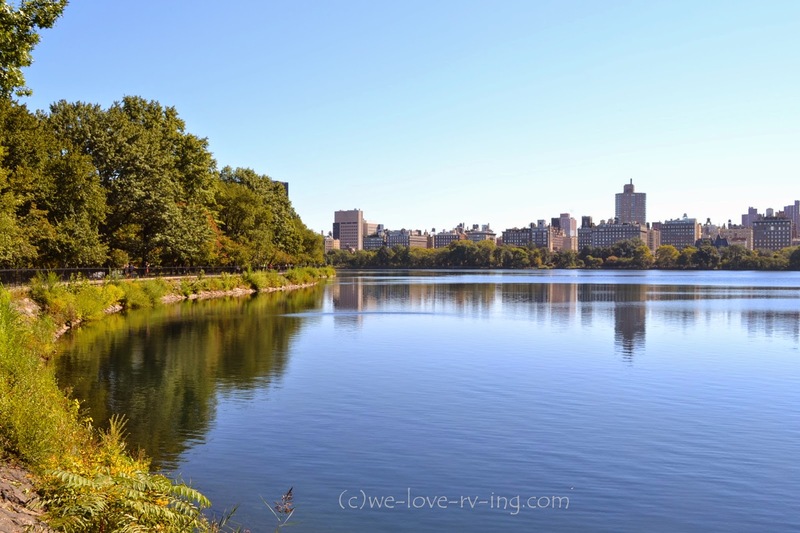 Central Park is a treasure for the 40 million annual visitors to enjoy. 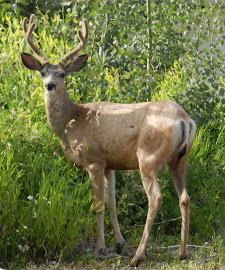 It is recognized as the premier public urban park in the world, constructed 1858-1873 and is entirely man-made. It is a National Historic Landmark as well as a New York City Scenic Landmark covering 843 acres in the center of Manhattan, New York. 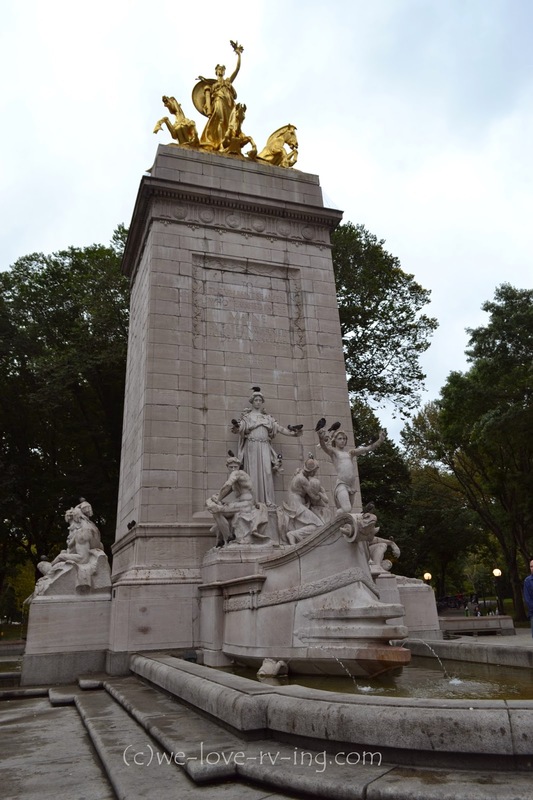 The Maine Monument, placed in the Park in 1913, is a marble and gilded bronze sculpture commemorating the 250 American sailors who died when the battleship Maine exploded. It was re-gilded in 1995 along with other repairs and greets the visitors who enter the park at the Southwest corner at Columbia Circle, which is also the point from which all official distances from New York City are measured. 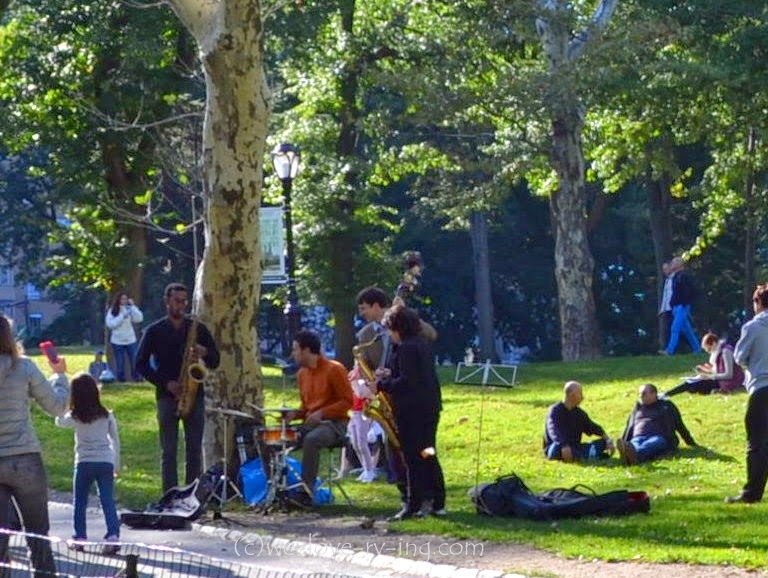 There are roads for vehicular traffic through the park that are closed on the weekends, but the miles of trails and paths that meander all over the Park for pedestrian and horse and carriage traffic offer so many sights to enjoy as well as gatherings such as this small band who just set up on the grass and play for anyone who chooses to listen. 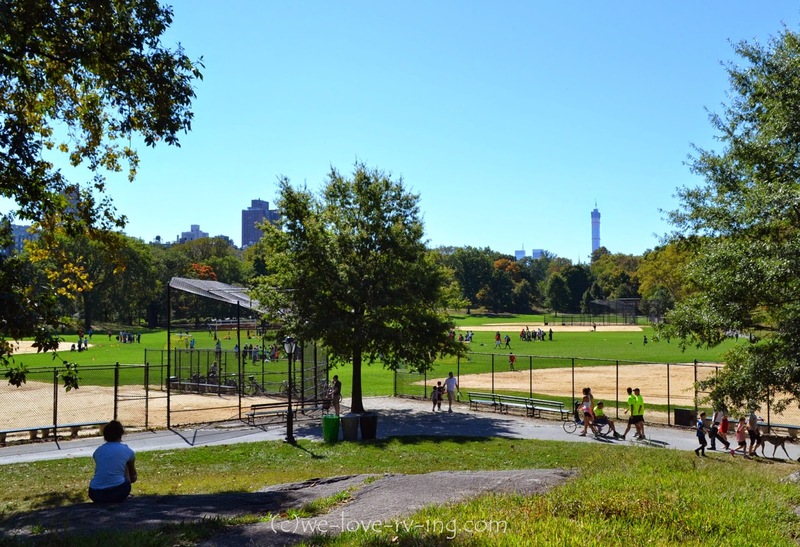 There are ball fields scattered around the Park as well as soccer fields, lawn bowling, croquet greens, tennis courts and tables permanently set up for chess and checkers that many gather to play and enjoy on any given day. These are used during spring, summer and fall but close down during winter. The two outdoor ice skating rinks are open between November and March. 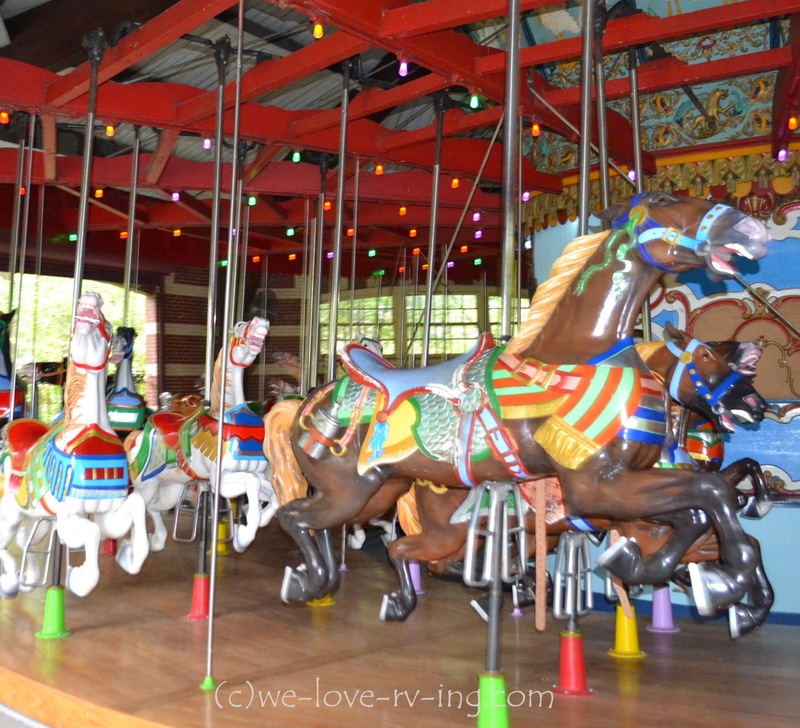 One very special sight is the Carousel that pulls you over when you hear the calliope music floating through the air. The Carousel, one of the largest in the U.S. and the fourth one in Central Park since 1871, was originally built in 1908 but came to the Park after being found abandoned when the previous carousels were destroyed by fire. The restoration included the 57 beautiful hand-carved horses. There are also twenty-one playgrounds in the park, most of them located near a Park entrance, and usually filled with lots of kids enjoying themselves. 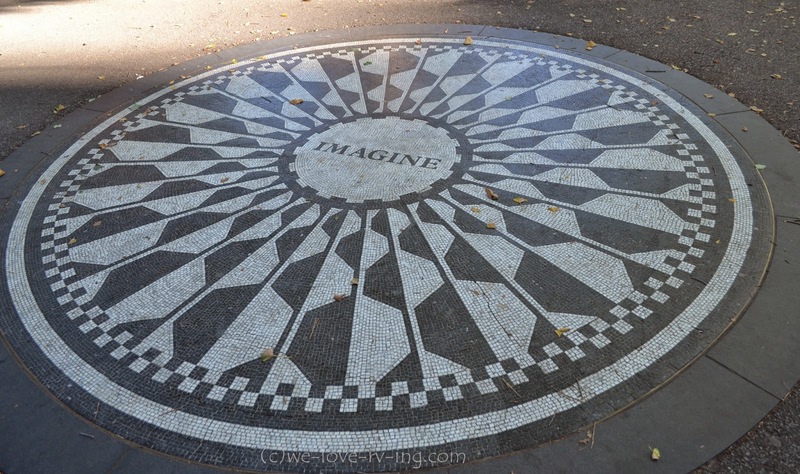 Strawberry Fields was one of our first stops to visit, created in honour of John Lennon of the Beatles. It was officially dedicated on October 9th, 1985 which would have been his 45th birthday, almost thirty years ago. The 5 acre site is covered with trees that were gifted from all over the world and the mosaic tile “Imagine” was a gift from the city of Naples. We walked by several times and there were always people lined up to take their photos on “Imagine”. This is deemed a Quiet Zone, as are other areas in the Park, which means there are no dogs, bike riding, skateboarding, running or sports played in this location. The Conservatory Garden covers six acres of Central Park where you will find flower beds and color throughout. There are three areas with different garden styles, Italian, French and English. 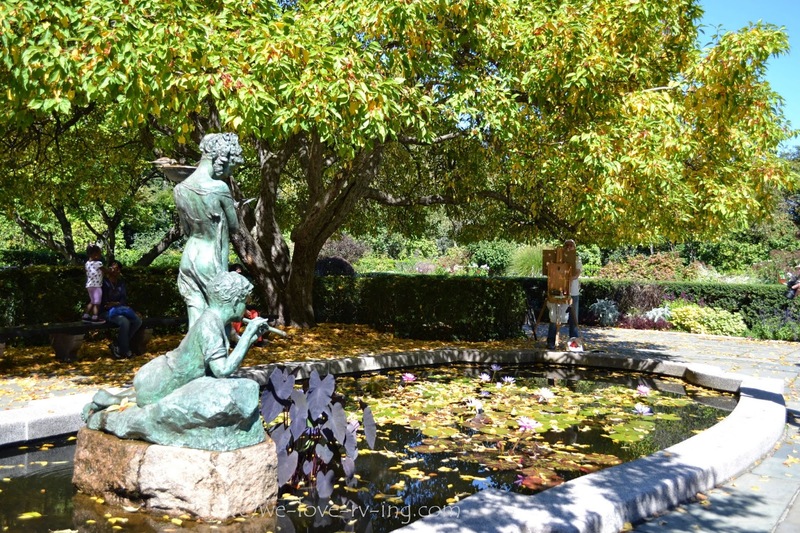 This water lily pond is in the English garden and is the Frances Hodgeson Burnett Memorial Fountain in honour of the author of the children’s book, The Secret Garden. The Conservatory Garden is also considered a Quiet Zone. There are several bridges within the Park, many of them are cast iron and no two are alike. The star of them all, though, is the Bow Bridge on The Lake. It was the first cast iron bridge, built in 1862, in the Park and is the second oldest in the world. The Bow Bridge is considered a very romantic spot, adorned with several large flower filled urns and has been the sight of many marriage proposals. 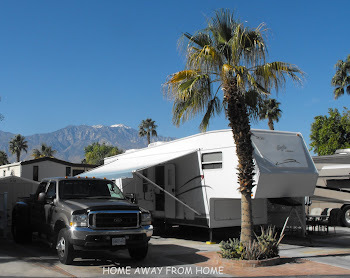 There are several lakes and ponds within the Park, ranging in size from The Lake at 20 acres to the Turtle Pond and The Pool being the smallest. The Lake, not to be confused with The Pond, has row boats, gondolas and bicycles that are available for rent. The Boathouse seen on The Lake’s edge has a restaurant offering a great view. The Pond, a habitat for birds and turtles has a natural environment making it a good place for them to be, as does Turtle Pond. The Conservatory Water is for remote controlled boats where Saturday morning boat races are held. The Jacqueline Kennedy Onassis Reservoir was so named in 1994 to commemorate all that she did for the city. The JKO Reservoir has a running path encircling it so we followed that around on one of our many walks in the Park. The 106 acre reservoir was used as the water source for the city for 131 years but was decommissioned in 1993. It has now become a great bird sanctuary, a perfect place for birdwatchers. 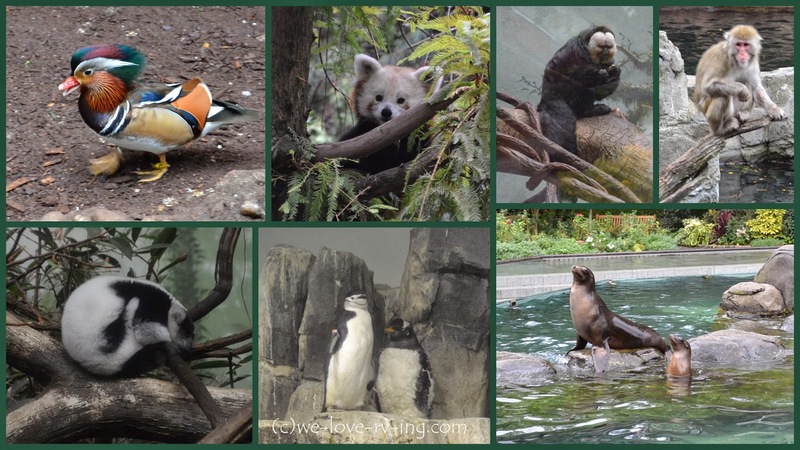 The Central Park Zoo is not a large one but has several very interesting habitats for the 130 different species. 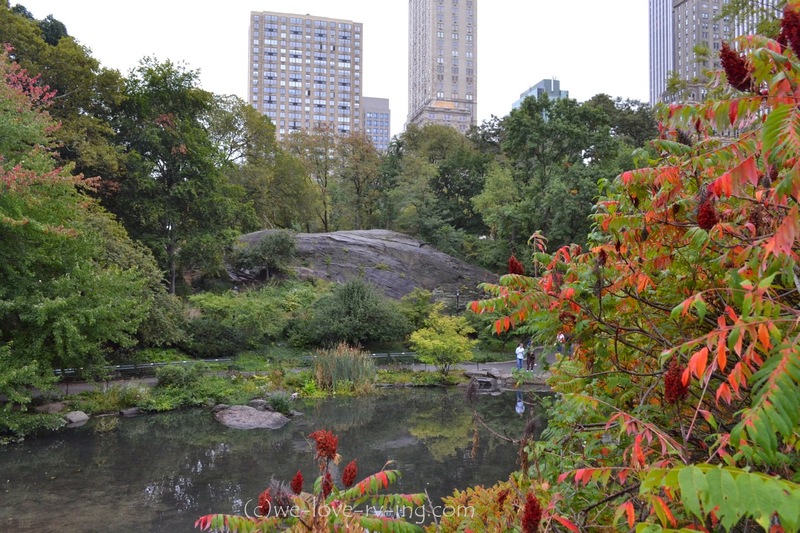 The Zoo, covering 5 acres, is in the Southeast corner of Central Park. We saw four different kinds of penguins in the Polar Seabird exhibit behind a glassed temperature controlled area, several breeds of monkeys all in different settings, the cutest Red Pandas, California sea lions waiting for dinner and some beautiful birds in their Tropical Rainforest surroundings. 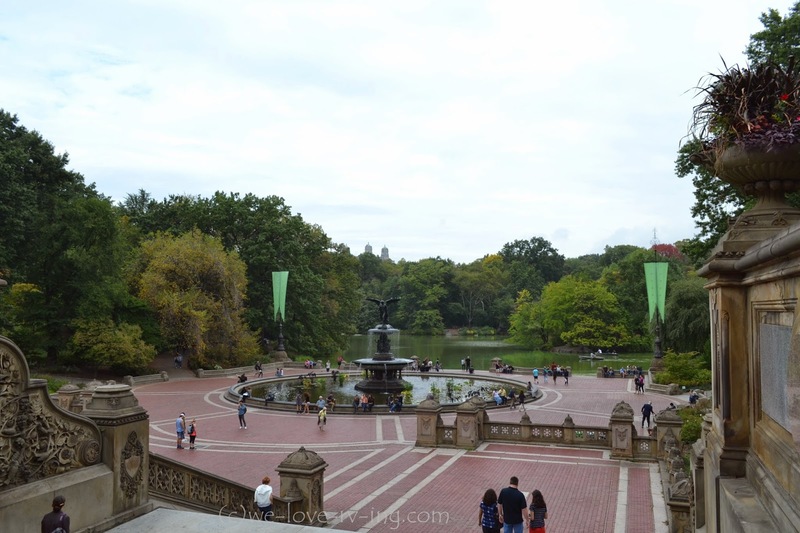 A beautiful European inspired terrace with two grand staircases leading down to the Bethesda Fountain is one of the most popular meeting places in Central Park. The fountain is one of New York’s largest standing at 26 feet high and 96 feet wide. The “Angels of the Waters” was created by Emma Stebbins, the first woman to receive a major sculptural commission in New York and it was dedicated in 1873. The angel’s outstretched hand delivers a blessing to the waters and the four cherubs represent health, purity, temperance and peace. There are some lovely serene locations within the park even when thousands of people are wandering through or spending time enjoying the many other things to see in Central Park. The leaves on the trees are beginning to turn color with fall weather but I am sure the blossoms in spring would be even more amazing. 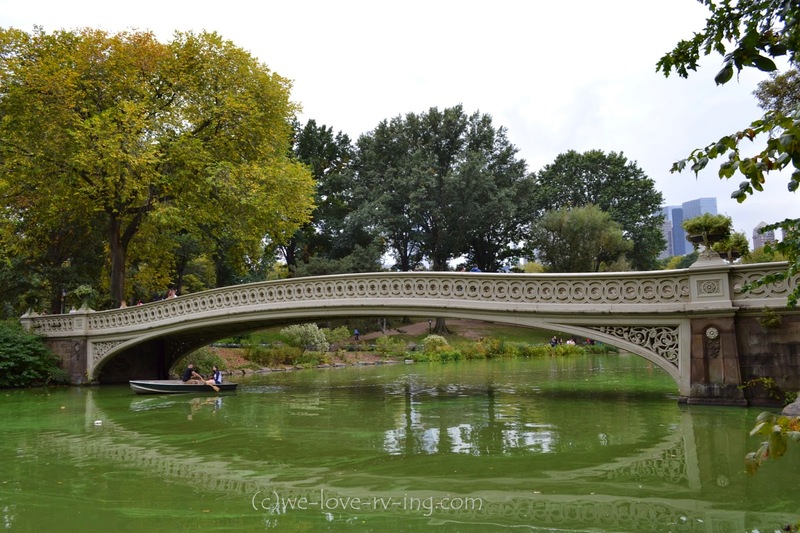 The Central Park Conservancy, the Park management, is a private, not-for-profit organization and in a public-private partnership with the City of New York. Their “mission is to restore, manage and enhance Central Park” and they do so with the help of many donations and volunteers. 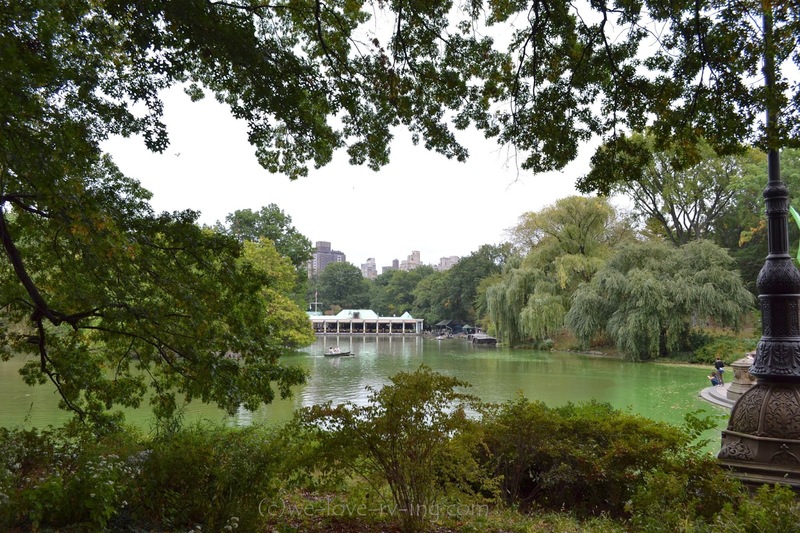 There have been several restorations done in the past years to make Central Park what it is today and to be the star that it was meant to be from the beginning. New York would not be what it is without Central Park, it truly is a treasure to be seen. Visit more of our visit to New York by clicking here. Thanks, Joy. Your New York experience sounds incredible, too! We didn't get names but we hired a carriage and horse then went for dinner at Tavern on the Green for our last day in New York!